LET THEM DEMOLISH THE HACIENDA, said Tony Wilson, a guest on BBC1's Northwest Tonight this evening. But Civic Society Chairman Carolyn Blain, responding via a live link-up from outside the Hacienda, urged developers to save the facade and build flats behind it. The fame of the Hacienda attracts thousands of young people from all over the world, she continued, quoting the example of Liverpool, where Paul McCartney's childhood home was recently opened by the National Trust. "Nostalgia's a disease!" said Tony Wilson, urging people to move on from the past and develop the city for the future. IF NOSTALGIA'S A DISEASE, then Tony Wilson may not appreciate my visits to Manchester 50 years ago, the latest of which I've just completed. Due to time constraints, I can't manage a weekly trip to 1948, but to make up for it, I'm now including photos, copied with the Kodak DC20 digital camera from microfilm and enhanced. See also the new index page. This isn't nostalgia, it's "time tourism" - I don't think we can understand the city of the present unless we know the city of the past - and the city that might have been. 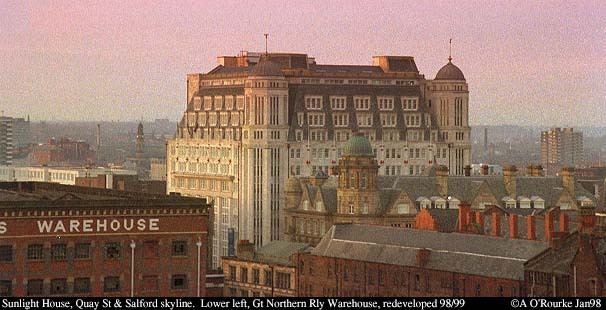 Read about the proposed Quay St skyscraper, and find out what "The Manchester" is - you wear it on your head, but it's not a hat! EXTRA HEADLINE FROM THIS EVENING: The two girls being held by the police have been charged with the murder in Failsworth of Lily Lillie (see below). Me, ( an ex-pat Manchester guy) and my wife (ex-pat Manchester resider - originally from New Mexico, USA) now living in Fort Myers, Florida, (got all that?) lol. Well. we think your website is phat! (Cool in latest USA speak). Keep up the good work. We have been here for 5 months now, having experienced, strange looking snakes, wandering alligators, brown recluse spiders, and Hurricane Georges. Your news from Manchester is a welcome break! If any of your readers are interested in 'whats goin on in America' we'll be happy to oblige. Phew, at first I thought "phat" meant... a word rhyming with it beginning with "cr..."! We have a bit of a spider problem here, due to the cool wet summer. And a Python escaped from a house on the Wirral. No alligators though, and today's rain certainly wasn't Hurricane Georges! I know I only live in Failsworth so I'm not really pining for views of the old home town miles away across the sea, but there does seem to be a bit of a bias towards south Manchester in your pages. I suppose that understandable if that's where you live, but is there any chance of showing the world what North Manchester looks like. Keep up the good work - this has got to be one of the best sites on the web ! 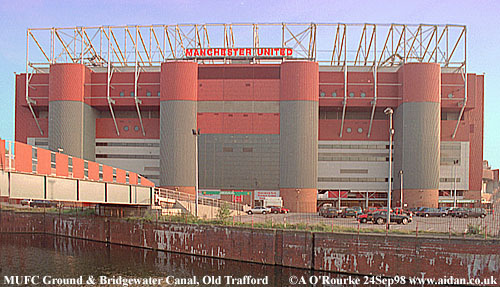 PS There is only one football club in Manchester - the "other one" is in Trafford !! Yes, there is a bit of a bias, and yes, I'm from south Manchester. If anything, it's biased towards the city centre. But what about my Oldham panorama, Prestwich, Heaton Park and Newton Heath pictures?. Please let me know of your favourite Failsworth locations, and I'll include them soon! Dear Aidan, just to let you know I enjoy your photo's immensely. Have lived in Sydney, Australia since 1970. Was born in the Hulme area in 1947. Who can I contact to find a street photo of the Coronation of the Queen taken in the Hulme area? An early memory is of streamers between the houses and the long tables set out for the street party. I was born in Duffield Street. Also is St Mary's school still there at Stretford? Keep up the good work - its great. The Local Studies Unit at Manchester Central Library has a large photo collection, which they're continuing to digitise, but you'll have to go there to see them. I'll have a look the next time I'm there. Duffield Street is no longer there - not sure about St Mary's School- what's the street name? Thanks for your comments. THE WEEK STARTED OFF TRIUMPHANTLY with the Commonwealth Games party held on Albert Square exactly one week ago. Tony Wilson was the compere, introducing a star-studded selection of Manchester's most exciting bands, including rap duo Parrish, with their two female dancers. After a number of delays, we linked up via satellite with Kuala Lumpur for the official handing over of the baton, and as Bobby Charlton said "Hello Manchester", the crowd cheered, and Prince Edward appeared on the steps of the Town Hall with 30 local youngsters, and gave an official welcome. Fireworks exploded in the blue Manchester sky, and a shower of little pieces of coloured paper rained down on the square. The show continued, and the Prince looked on dispassionately as New Order, then James and ex-Take That member Howard Donald performed live. Councillor Pat Karney described the event as "one of the greatest days in Manchester's history". But some MEN readers were less than impressed with the music. "Why not pick someone who can sing in tune and play? ", asked Kevin Neill of Blackley. I don't think either of those attributes are necessary to get into the charts these days! By mid-afternoon, the square was back to normal - For the city, it was an an expensive two hours, but worth it! THE FUTURE OF MANCHESTER UNITED hangs in the balance, and Mick Hucknall, perhaps Manchester's most famous pop star, denied he was planning to buy the club. There had been specilation that he was holding talks with Ted Turner and CNN about a bid for Manchester United. A CNN/Mick Hucknall offer would probably gain the approval of the fans. The United board has already accepted the 623.4 million pound offer from Rupert Murdoch, but is legally obliged to consider a higher offer. And Manchester's other football club was in the news on Thursday. The club have made an annual loss of 6.3 million pounds. Chairman David Bernstein said the loss was due in part to its relegation to the second division. MANCHESTER-BASED NORTH WESTERN TRAINS were featured on the national BBC news this evening. They're one of the companies that took over the running of the railways from British Rail, under the Conservatives' rail privatisation. Attempts to upgrade services haven't led to the desired success. For instance, direct services were introduced from Rochdale to London, but despite publicity and competitive fares, the response from the public has been disappointing. Fares are going to rise, 200 jobs are to go and services will be scaled down. The �10 single fare to London will be increased to �25 and the �20 return will go up to �34. FIFTEEN MANCHESTER SCHOOLS are faced with closure, though Abbot Primary School, in Collyhurst, was given a reprieve after parents complained. The problem is that pupil numbers have fallen, and the low numbers are causing a waste of resources. 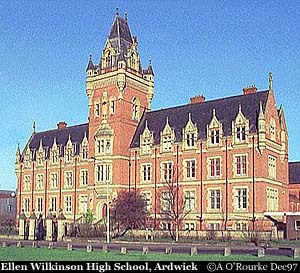 One of the schools on the list is the magnificent Ellen Wilkinson School, on Hyde Road, Ardwick. The main building was designed by Thomas Worthington in 1880. TWO MEN WERE SHOT in an incident in a shop on Tib Street on Thursday. A 16 year old entered the New Cross Army Surplus store, and when he tried to leave with a bullet-proof vest, he pulled out a gun and shot owner Frank Lanagan, 43 and his son Stephen, 25. The gunman was described as dark black, five foot seven, and slightly built. He headed off on a mountain bike to the Shude Hill area. The two men survived and are recovering in hospital. The shop is just down the street from the Cebu Filipino cafe, which we went to recently. We looked in the window of the army surplus store and wondered who would want to buy this sort of merchandise. The bullet proof vest cost �500. Hand guns were banned after the Dunblane tragedy, but according to an article by Andrew Nott on Saturday's MEN front page, air pistols are being converted into lethal guns and sold to gangs. Though air pistols are less dangerous than "real" guns, it seems absurd that they can still be bought. 16 year old budding basketball start Jermaine Bell of Hulme, was killed by a converted pistol of this type a few weeks ago. THREE RACIST STORIES have featured in the local news this week. On Tuesday there were reports of a medical professor at Manchester University being investigated after alleged racist remarks. On Thursday came the news that GMR radio presenter James Reeve had resigned after being accused of making racist remarks on a radio programme. "I've spent the last 12 years fighting racism by confronting it on my programmes," he said. The discussion was in connection with the much-criticised ad campaign by the Commission for Racial Equality which used fictitious racist ads, aimed to provoke. A follow up ad appeared, asking "What was worse? 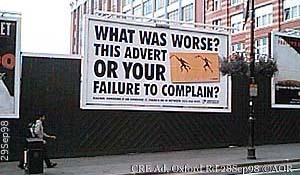 This ad your failure to complain?". In my opinion, this campaign reinforces the very racist stereotypes it's aiming to challenge. And controversial comedian Bernard Manning was criticised for his remarks about black people on Mrs Merton's spoof chat show. 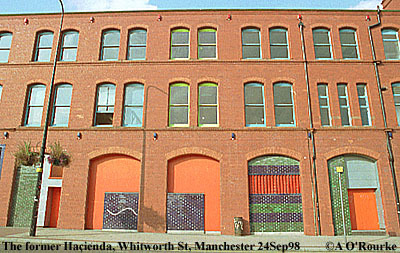 THE HACIENDA IS TO BE DEMOLISHED - new owners G R Morris Construction have again confirmed what we heard last week. I was wondering what Tony Wilson would think. I was surprised to discover in Carl Palmer's "The Diary" (MEN), that he doesn't object to the plan, and he's criticised the Manchester Civic Society for wanting to turn it into a museum, and added that he thought the Society was "holding the city back". 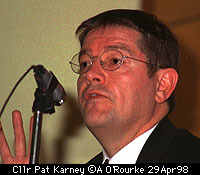 An unlikely supporter of the moves to save the Hacienda is Pat Karney* (the same names keep cropping up, don't they?! ), who went to the Hacienda in its heyday. I think it would be great pity to destroy the building. Civic Society chairman Carolyn Blain said: "The Hacienda is a legend. it has shaped an entire generation of music. It doesn't deserve the same fate as the Cavern Club in Liverpool or the Casino in Wigan." THIS WEEK THE WEATHER IN MANCHESTER has been exceptionally warm and sunny. It's been a regular Indian Summer and a welcome departure from the cloudy and rainy weather we experienced in previous months. I was out every day with my camera, and how have some 150 usable photographs, which will be appearing on this website during the coming weeks. The sunny spell came to an end yesterday with cloudy and misty weather. We encountered thick fog driving between Buxton and Macclesfield - the Cat and Fiddle was only just visible - photo coming soon! Today there was hazy sunshine and it was fairly warm. The current EWM temperature is 54/12. The photo below was taken very near to where I grew up, on Edgeley Road, Cheadle Heath, Stockport. The top of the hill, near Alexandra Park gives tantalising glimpse over lower ground. The silhouetted flats are in Wythenshawe. Hi Aidan , over 52 years ago I cycled over the moors between Buxton and Macclesfield . We stopped at the Cat and Fiddle and asked for a drink of water . We were early teenagers so a beer was out of the question . Low rainfall had depleted their tanks so we were refused . A little way up beyond the pub we saw sheep at a spring . We quickly cleared a path and drank from the small pool . It was so cool and refreshing . We didn't catch anything from drinking the water . Have you any photographs of the area ? Always enjoy your site . I took one of the Cat and Fiddle for you - but it's in thick fog! Well, at least I tried! I'll put it online this week. I'm looking forward to taking one of the hills near the C&F covered in snow. Let's hope we get some decent snowfall this winter. I recently moved to Australia, having lived near Manchester for many years, and have recently discovered your web site and your photographs on Manchesteronline. I am very interested to know if any copies of your photographs are available for sale, and would be grateful if you could let me know. At the moment I don't have a system set up to supply prints by post. I've sold copies as high resolution files to magazines, and they've paid me by bank transfer. Until I have a credit card payment facility set up, (coming soon) I can't sell to individuals. Which pictures are you particularly interested in? Thanks very much for contacting, and please keep visiting. I seem to remember drinking at this pub on a Saturday Night in the late '40's and early '50's. If it is the same place then they used to have refrigerated beer (the only place in Manchester at that time). We became such regular customers and tipped well, that the waitress started to provide the gang with cheese sandwiches from her own kitchen. That was when a pint of beer cost about sixpence. Or so I remember. Please keep this nostalgia coming. Is Handleys bakery still on the street behind Chapel Street, opposite the Salford Royal Hospital?? Last seen in 1941. Unless I'm very much mistaken, Handley's, like Salford Royal Hospital, bit the dust a long time ago. I'll have a look for traces the next time I pass there, and I'll take a photo. The building which housed Salford Royal Hospital is up for sale, but as far as I know, hasn't found a buyer yet. I think you'd hardly recognise that area now.